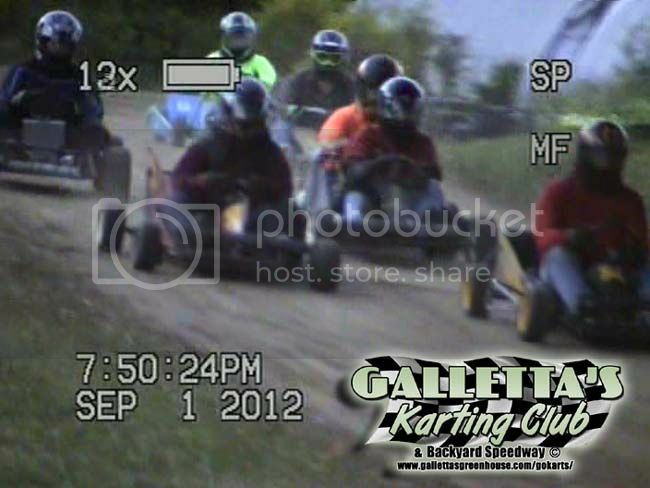 Galletta's Greenhouse Karting Club | September 1st, 2012 &quot;Busket Case is a Raving Lunatic 50!&quot; 50-Lapper/12-Karts | Town of Oswego, NY! 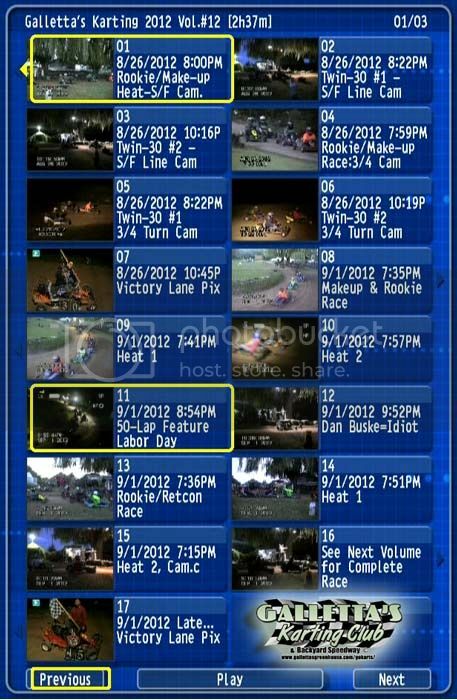 PS- Dan "Busket Case" Buske is indefinitely barred from the property for his irrational, out-of-control, unwarranted and empirically false, hysterica-fueled temper tantrum based on ignorance of how terrible of a driver he was and complete disrespect for the agreed upon rules of our backyard speedway). Crafty lil' Matty-Joe did it again by methodically picking drivers off in the low groove - par for the course most weeks, which is why we suspect many people either give up or never try racing in the Galletta's karting club. 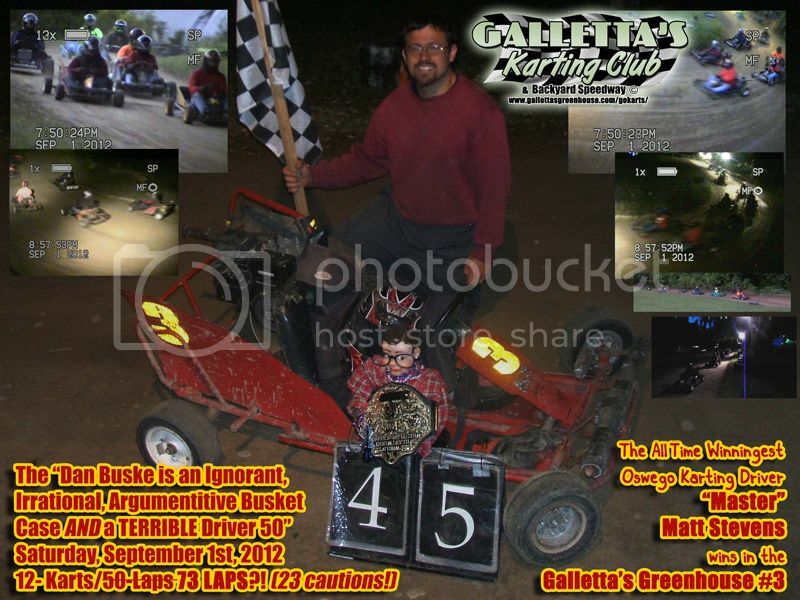 He is pretty darn tough to beat in his trusty ol' Galletta's Greenhouse #3... the oldest, and most win-decorated chassis on the track! Good heat race was a battle between Adam Lytle and Chris Stevens. Chris caught him on a restart and picked up (despite being 2nd in points) only his 2nd heat win of the 2012 season! 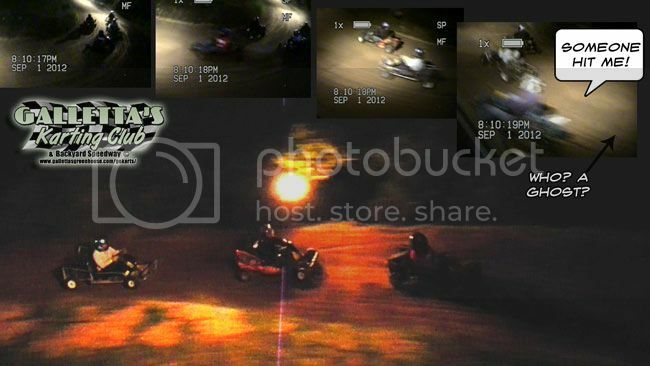 Meanwhile, a rookie named Dan Buske found a way to (1) fly off the track with nobody near him on lap one, and (2) spin out all by himself and slam the inside hub rail at a high velocity on the last lap. Normally, this isn't newsworthy, especially when 1st-time-on-track rookies are involved... but just wait. One of our biggest features of the season still could not fill all of the karts. If we only had a few more drivers any given week, we could pull off a twenty kart race. In fact, we could pull one off EVERY week if drivers just simply showed up when it's time to race. Our track - unlike others in the local area - is large enough for that karet count and more. And most weeks we have race-ready/feature-winning/arrive-and-drive karts sitting idle. Where are the drivers in a race town like Oswego? Especially considering the local racetrack is essentially done for the season minus a few fall shows. 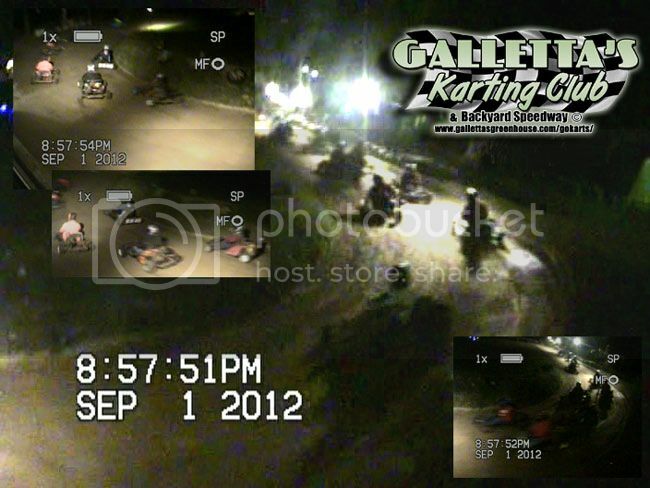 Fill up these karts and race with the longest-running and most-experienced karting class in Oswego County! Some karts are backups reserved for their owners. Others are available for any/all racers (You?). -- (Galletta's Greenhouse #0) <- has won a Klassic and tons of features with various drivers and nobody drives it?! -- (Galletta's Greenhouse #2) <- has won a Klassic and tons of features with various drivers and nobody drives it?! The race had a lot of drivers (GOOD!)... but two things were against us that historically make for a long, crank evening... late start, a full moon, and a handful of drivers in their very 1st feature race at Galletta's. If tradition says anything, some crazy things can happen when those things all line up. Disqualified x2 for arguing with drivers, officials and refusing to leave the premesis! DQ1 = Disqualified for violating the 1st-timer three-strikes-and-you're-out rule in addition to repeated warnings for being directly involved in too many cautions (the cut-off according to the rules is three-strikes-and-you're-out for 1st-timers, but was given a few mulligans via being warned three times and was directly involved with over seven cautions each) and had to park the kart for the remainder of the feature. DQ2 = Disqualified for in angrily berating and arguing against track officials/owners/operators/veteran drivers without even one empirical point in his favor for arguing, including not exiting the property when told to on more tha one occasion, saying that he has "bigger balls" than not only everybody at the track that night, but everybody who ever raced here in our seventeen+ years of racing history, and calling everybody at the track, "a bunch of retards". They lose earned place and in addition have their points negated x2, and if ever seen again, may have further penalties inflicted upon him.